Adult development encompasses the changes that occur in biological and psychological domains of human life from the end of adolescence until the end of one's life. These changes may be gradual or rapid, and can reflect positive, negative, or no change from previous levels of functioning. Changes occur at the cellular level and are partially explained by biological theories of adult development and aging. Biological changes influence psychological and interpersonal/social developmental changes, which are often described by stage theories of human development. Stage theories typically focus on “age-appropriate” developmental tasks to be achieved at each stage. Erik Erikson and Carl Jung proposed stage theories of human development that encompass the entire life span, and emphasized the potential for positive change very late in life. Biomedical theories hold that one can age successfully by caring for physical health and minimizing loss in function, whereas psychosocial theories posit that capitalizing upon social and cognitive resources, such as a positive attitude or social support from neighbors and friends, is key to aging successfully. Jeanne Louise Calment exemplifies successful aging as the longest living person, dying at the age of 122 years. Her long life can be attributed to her genetics (both parents lived into their 80s) and her active lifestyle and optimistic attitude. She enjoyed many hobbies and physical activities and believed that laughter contributed to her longevity. She poured olive oil on all of her food and skin, which she believed also contributed to her long life and youthful appearance. Changes in adulthood have been described by a number of theories and metatheories, which serve as framework for adult development research. Life span development is an overarching framework that considers individual development (ontogeny) from conception to old age. The framework considers the lifelong accumulation of developmental gains and losses, with the relative proportion of gains to losses diminishing over an individual’s lifetime. According to this theory, life span development has multiple trajectories (positive, negative, stable) and causes (biological, psychological, social, and cultural). Individual variation is a hallmark of this theory – not all individuals develop and age at the same rate and in the same manner. 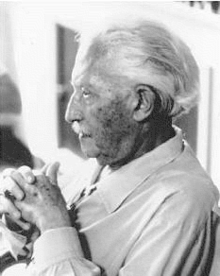 Erik Erikson, psychosocial development theorist. Erik Erikson developed stages of ego development that extended through childhood, adolescence and adulthood. He was trained in psychoanalysis and was highly influenced by Freud, but unlike Freud, Erikson believed that social interaction is very important to the individual's psychosocial development. His stage theory consists of 8 stages in life from birth to old age, each of which is characterized by a specific developmental task. During each stage, one developmental task is dominant, but may be carried forward into later stages as well. According to Erikson, individuals may experience tension when advancing to new stages of development, and seek to establish equilibrium within each stage. Carl Jung, a Swiss psychoanalyst, formulated four stages of development and believed that development was a function of reconciling opposing forces. Childhood: (birth to puberty) Childhood has two substages. The archaic stage is characterized by sporadic consciousness, while the monarchic stage represents the beginning of logical and abstract thinking. The ego starts to develop. Youth: (puberty until 35 – 40) Maturing sexuality, growing consciousness, and a realization that the carefree days of childhood are gone forever. People strive to gain independence, find a mate, and raise a family. Middle Life: (40-60) The realization that you will not live forever creates tension. If you desperately try to cling to youth, you will fail in the process of self-realization. Jung believed that in midlife, one confronts one's shadow. Religiosity may increase during this period, according to Jung. Human development happens concurrently at biological, psychological and social levels throughout life, and a full descriptive account of development must include all three levels. Development at each of these three levels reciprocally influences the other two levels; therefore nature (biology) and nurture (social environment) are in constant complex interaction, when considering how and why psychological development occurs. Biological, psychological and social descriptions and explanations are all as valid as each other, and no level has causal primacy over the other two. Any aspect of human development is best described and explained in relation to the whole person and their social context, as well as to their biological and cognitive-affective parts. This can be called a holistic or contextualist viewpoint, and can be contrasted with the reductionist approach to development, which tends to focus solely on biological or mechanistic explanations. Physical development in midlife and beyond include changes at the biological level (senescence) and larger organ and musculoskeletal levels. Sensory changes and degeneration begin to be common in midlife. Degeneration can include the break down of muscle, bones and joints, leading to physical ailments such as sarcopenia or arthritis. At the sensory level, changes occur to vision, hearing, taste, touch, and smell, and taste. Two common sensory changes that begin in midlife include our ability to see close objects and our ability to hear high pitches. Other developmental changes to vision might include cataracts, glaucoma, and the loss of central visual field with macular degeneration . Hearing also becomes impaired in midlife and aging adults, particularly in men. In the past 30 years, hearing impairment has doubled. Hearing aids as an aid for hearing loss still leave many individuals dissatisfied with their quality of hearing. Olfaction can co-occur with changes in sense of taste. “Olfactory dysfunction can impair quality of life and may be a marker for other deficits and illnesses” and can also lead to decreased satisfaction in taste when eating. Losses to the sense of touch are usually noticed when there is a decline in the ability to detect a vibratory stimulus. The loss in sense of touch can harm a person’s fine motor skills such as writing and using utensils. The ability to feel painful stimuli is usually preserved in aging, but the process of decline for touch is accelerated in those with diabetes. Physical deterioration to the body begins to increase in midlife and late life, and includes degeneration of muscle, bones, and joints. Sarcopenia, a normal developmental change, is the degeneration of muscle mass, which includes both strength and quality. This change occurs even in those who consider themselves athletes, and is accelerated by physical inactivity. Many of the contributing factors that may cause sarcopenia include neuronal and hormonal changes, inadequate nutrition, and physical inactivity. Apoptosis has also been suggested as an underlying mechanism in the progression of sarcopenia. The prevalence of sarcopenia increases as people age and is associated with the increased likelihood of disability and restricted independence among elderly people. Approaches to preventing and treating sarcopenia are being explored by researchers. A specific preventative approach includes progressive resistance training, which is safe and effective for the elderly. Developmental changes to various organs and organ systems occur throughout life. These changes affect responses to stress and illness, and can compromise the body’s ability to cope with demand on organs. The altered functioning of the heart, lungs, and even skin in old age can be attributed to factors like cell death or endocrine hormones. There are changes to the reproductive system in midlife adults, most notably menopause for women, the permanent end of fertility. In men, hormonal changes also affect their reproductive and sexual physiology, but these changes are not as extreme as those experienced by women. As adult bodies undergo a variety of physical changes that cause health to decline, a higher risk of contracting a variety of illnesses, both physical and mental, is possible. Scientists have made a distinctive connection between aging and cancer. It has been shown that the majority of cancer cases occur in those over 50 years of age. This may be due to the decline in strength of the immune system as one ages or co existing conditions. There a variety of symptoms associated with cancer, commonly growths or tumors may be indicators of cancer. Radiation, chemotherapy, and in some cases, surgery, is used to treat the cancer. Osteoarthritis is one of the most commonly experienced illnesses in adults as they age. Although there are a variety of types of arthritis they all include very similar symptoms: aching joints, stiff joints, continued joint pain, and problems moving joints. It has been found that older age does increase the risk factor of contracting a cardiovascular disease. Hypertension and high cholesterol have also been found to increase the likelihood of acquiring a cardiovascular disease, which are also commonly found in older adults. Cardiovascular diseases include a variety of heart conditions that may induce a heart attack or other heart-related problems. Healthy eating, exercise, and avoiding smoking are usually used to prevent cardiovascular disease. Infection occurs more easily as one ages, as the immune system starts to slow and become less effective. Aging also changes how the immune system reacts to infection, making new infections harder to detect and attack. Essentially, the immune system has a higher chance of being compromised the older one gets. New neurons are constantly formed from stem cells in parts of the adult brain throughout adulthood, a process called adult neurogenesis. The hippocampus is the area of the brain that is most active in neurogenesis. Research shows that thousands of new neurons are produced in the hippocampus every day. The brain constantly changes and rewires itself throughout adulthood, a process known as neuroplasticity. Evidence suggests that the brain changes in response to diet, exercise, social environment, stress and toxin intake. These same external factors also influence genetic expression throughout adult life - a phenomenon known as genetic plasticity. Dementia is characterized by persistent, multiple cognitive deficits in the domains including, but not limited to, memory, language, and visuospatial skills and can result from central nervous system dysfunction. Two forms of dementia exist: degenerative and nondegenerative. The progression of nondegenerative dementias, like head trauma and brain infections, can be slowed or halted but degenerative forms of dementia, like Parkinson’s disease, Alzheimer’s disease, and Huntington’s are irreversible and incurable. A time lapse showing the advancement of plaques and tangles in Alzheimer's disease tissue. Alzheimer's disease (AD) was discovered in 1907 by Dr. Alois Alzheimer, a German neuropathologist and psychiatrist. Physiological abnormalities associated with AD include neurofibrillary plaques and tangles. Neuritic plaques, that target the outer regions of the cortex, consist of withering neuronal material from a protein, amyloid-beta. Neurofibrillary tangles, paired helical filaments containing over-phosphorylated tau protein, are located within the nerve cell. Early symptoms of AD include difficulty remembering names and events, while later symptoms include impaired judgment, disorientation, confusion, behavior changes, and difficulty speaking, swallowing, and walking. After initial diagnosis, a person with AD can live, on average, an additional 3 to 10 years with the disease. In 2013, it was estimated that 5.2 million Americans of all ages had AD. Environmental factors such as head trauma, high cholesterol, and type 2 diabetes can increase the likelihood of AD. Huntington's disease (HD) named after George Huntington is a disorder that is caused by an inherited defect in a single gene on chromosome 4, resulting in a progressive loss of mental faculties and physical control. HD affects muscle coordination (involuntary writhing) and leads to cognitive decline and psychiatric issues. Symptoms usually appear between the ages of 30-50 but can occur at any age, including adolescence. There is currently no cure for HD and treatments focus on managing symptoms and quality of life. Current estimates claim that 1 in 10,000 Americans have HD, however, 1 in 250,000 are at-risk of inheriting it from a parent. Most individuals with HD live 10 to 20 years after a diagnosis. Parkinson's disease (PD) was first described by James Parkinson in 1817. It typically affects people over the age of 50. PD is related to damaged nerve cells that produce dopamine. Common symptoms experienced by people with PD include trembling of the hands, arms, legs, jaw, or head; rigidity (stiffness in limbs and the midsection); bradykinesia; and postural instability, leading to impaired balance and/or coordination. PD cannot be cured, but diagnosis and treatment can help relieve symptoms. Treatment options include medications like Carbidopa/Levodopa (L-dopa), that reduce the severity of motor symptoms in patients. Alternative treatment options include non-pharmacological therapy. Surgery (pallidotomy, thalamotomy) is often viewed as the last viable option. Older adults represent a significant proportion of the population, and this proportion is expected to increase with time. Mental health concerns of older adults are important at treatment and support levels, as well as policy issues. The prevalence of suicide among older adults is higher than in any other age group. Depression is one of the most common disorders that presents in old age and is comorbid with other physical and psychiatric conditions, perhaps due to the stress induced by these conditions. In older adults, depression presents as impairments already associated with age such as memory and psychomotor speed. Research indicates that higher levels of exercise can decrease the likelihood of depression in older adults even after taking into consideration factors such as chronic conditions, body mass index, and social relationships. In addition to exercise, behavioral rehabilitation and prescribed antidepressants, which is well tolerated in older adults, can be used to treat depression. Anxiety is a relatively uncommon diagnosis in older adults and it difficult to determine its prevalence. Anxiety disorders in late life are more likely to be under-diagnosed because of medical comorbidity, cognitive decline, and changes in life circumstances that younger adults do not face. However, in the Epidemiological Catchment Area Project, researchers found that 6-month prevalence rates for anxiety disorders were lowest for the 65 years of age and older cohort. A recent study found that the prevalence of general anxiety disorder (GAD) in adults aged 55 or older in the United States was 33.7% with an onset before the age of 50. ADHD is generally believed to be a children’s disorder and is not commonly studied in adults. However, ADHD in adults results in lower household incomes, less educational achievement as well as a higher risk of marital issues and substance abuse. Activities such as driving can be affected; adults who suffer from inattentiveness due to ADHD experience increased rates of car accidents. Adults with ADHD tend to be more creative, vibrant, aware of multiple activities, and are able to multitask when interested in a certain topic. The impact of mental disorders such as schizophrenia, other forms of psychosis, and bipolar disorder in adulthood is largely mediated by the environmental context. Those in hospitals and nursing homes differ in risk for a multitude of disorders in comparison to community-dwelling older adults. Differences in how these environments treat mental illness and provide social support could help explain disparities and lead to better knowledge of how these disorders are manifested in adulthood. Exercising four to six times a week for thirty to sixty minutes has physical and cognitive effects such as lowering blood sugar and increasing neural plasticity. Physical activity reduces loss of function by 10% each decade after the age of 60 and active individuals drop their rate of decline in half. Cardio activities like walking promote endurance while strength, flexibility, and balance can all be improved through Tai Chi, yoga, and water aerobics. Diets containing foods with calcium, fiber, and potassium are especially important for good health while eliminating foods with high sodium or fat content. A well-balanced diet can increase resistance to disease and improve management of chronic health problems thus making nutrition an important factor for health and well-being in adulthood. Mental stimulation and optimism are vital to health and well-being in late adulthood. Adults who participate in intellectually stimulating activities every day are more likely to maintain their cognitive faculties and are less likely to show a decline in memory abilities. Mental exercise activities such as crossword puzzles, spatial reasoning tasks, and other mentally stimulating activities can help adults increase their brain fitness. Additionally, researchers have found that optimism, community engagement, physical activity and emotional support can help older adults maintain their resiliency as they continue through their life span. Cognitive, physical, and social losses, as well as gains, are to be expected throughout the lifespan. Older adults typically self-report having a higher sense of well-being than their younger counterparts because of their emotional self-regulation. Researchers use Selective Optimization with Compensation Theory to explain how adults compensate for changes to their mental and physical abilities, as well as their social realities. Older adults can use both internal and external resources to help cope with these changes. The loss of loved ones and ensuing grief and bereavement are inevitable parts of life. Positive coping strategies are used when faced with emotional crises, as well as when coping with everyday mental and physical losses. Adult development comes with both gains and losses, and it is important to be aware and plan ahead for these changes in order to age successfully. Personality change and stability occur in adulthood. For example, self-confidence, warmth, self-control, and emotional stability increase with age, whereas neuroticism and openness to experience tend to decline with age. Two types of statistics are used to classify personality change over the life span. Rank-order change refers to a change in an individual’s personality trait relative to other individuals. Mean-level change refers to absolute change in the individual’s level of a certain trait over time. The plaster hypothesis refers to personality traits tending to stabilize by age 30. Stability in personality throughout adulthood has been observed in longitudinal and sequential research. However, personality also changes. Research on the Big 5 Personality traits include a decrease in openness and extraversion in adulthood; an increase of agreeableness with age; peak conscientiousness in middle age; and a decrease of neuroticism late in life. The concepts of both adjustment and growth as developmental processes help reconcile the large body of evidence for personality stability and the growing body of evidence for personality change. There are normative adjustments in personality with increasing age, but personality is largely stable throughout adulthood. According to the lifespan approach, intelligence is a multidimensional and multidirectional construct characterized by plasticity and interindividual variability. Intellectual development throughout the lifespan is characterized by decline as well as stability and improvement. Mechanics of intelligence, the basic architecture of information processing, decreases with age. Pragmatic intelligence, knowledge acquired through culture and experience, remains relatively stable with age. The psychometric approach assesses intelligence based on scores on standardized tests such as the Wechsler Adult Intelligence Scale and Stanford Binet for children. The Cognitive Structural approach measures intelligence by assessing the ways people conceptualize and solve problems, rather than by test scores. Primary mental abilities are independent groups of factors that contribute to intelligent behavior and include word fluency, verbal comprehension, spatial visualization, number facility, associative memory, reasoning, and perceptual speed. Primary mental abilities decline around the age of 60 and may interfere with life functioning. Secondary mental abilities include crystallized intelligence (knowledge acquired through experience) and fluid intelligence (abilities of flexible and abstract thinking). Fluid intelligence declines steadily in adulthood while crystallized intelligence increases and remains fairly stable with age until very late in life. A combination of friendships and family are the support system for many individuals and an integral part of their lives from young adulthood to old age. Ties to family become increasingly important in old age. Family relationships tend to be some of the most enduring bonds created within one’s lifetime. As adults age, their children often feel a sense of filial obligation, in which they feel obligated to care for their parents. This is particularly prominent in Asian cultures. Marital satisfaction remains high in older couples, oftentimes increasing shortly after retirement. This can be attributed to increased maturity and reduced conflict within the relationship. However, when health problems arise, the relationship can become strained. Studies of spousal caregivers of individuals with Alzheimer’s disease show marital satisfaction is significantly lower than in couples who are not afflicted. Most people will experience the loss of a family member by death within their lifetime. This life event is usually accompanied by some form of bereavement, or grief. There is no set time frame for a mourning period after a loved one passes away, rather every person experiences bereavement in a different form and manner. Friendships, similar to family relationships, are often the support system for many individuals and a fundamental aspect of life from young adulthood to old age. Social friendships are important to emotional fulfillment, behavioral adjustment, and cognitive function. Research has shown that emotional closeness in relationships greatly increases with age even though the number of social relationships and the development of new relationships begin to decline. In young adulthood, friendships are grounded in similar aged peers with similar goals, though these relations might be more transitory. In older adulthood, friendships have been found to be much deeper and longer lasting. While small in number, the quality of relationships is generally thought to be much stronger for older adults. Retirement, or the point in which a person stops employment entirely, is often a time of psychological distress or a time of high quality and enhanced subjective well-being for individuals. Most individuals choose to retire between the ages of 50 to 70, and researchers have examined how this transition affects subjective well-being in old age. One study examined subjective well-being in retirement as a function of marital quality, life course, and gender. Results indicated a positive correlation between well-being for married couples who retire around the same time compared to couples in which one spouse retires while the other continues to work. Retirement communities provide for individuals who want to live independently but do not wish to maintain a home. They can maintain their autonomy while living in a community with individuals who are similar in age as well as within the same stage of life. Resident in assisted living facility. Assisted living facilities are housing options for older adults that provide a supportive living arrangement for people who need assistance with personal care, such as bathing or taking medications, but are not so impaired that they need 24-hour care. These facilities provide older adults with a home-like environment and personal control while helping to meet residents’ daily routines and special needs. Adult day care is designed to provide social support, companionship, healthcare, and other services for adult family members who may pose safety risks if left at home alone while another family member, typically a care giver, must work or otherwise leave the home. Adults who have cognitive impairments should be carefully introduced to adult day care. Nursing home facilities provide residents with 24-hour skilled medical or intermediate care. A nursing home is typically seen as a decision of last resort for many family members. While the patient is receiving comprehensive care, the cost of nursing homes can be very high with few insurance companies choosing to cover it. ^ Hayflick, L. (1998). How and why we age. Experimental Gerontology, 33, 639-653. ^ Robinson, O.C. (2012). Development through Adulthood: An integrative sourcebook. Palgrave Macmillan. ^ Baltes, P. B., Lindenberger, U., & Staudinger, U. M. (2006). Life span theory in developmental psychology. In R. M. Lerner & W. Damon (Eds. ), Handbook of child psychology:Theoretical models of human development (pp. 569-664). Hoboken, NJ: John Wiley. ^ Erikson, E. H. (1980). Identity and the life cycle. London: W.W.Norton & Co.
^ Commons, M. L., & Kjorlien, O. A. (2016). The Meta-Cross-Paradigmatic Order and Stage 16. Behavioral Development Bulletin, 21(2), 154. ^ Levinson, D.J. (1986). A conception of adult development. American Psychologist, 41, 3–13. ^ Wrightsman, L.S. (1994). "Theories and Concepts". Adult Personality Development. 1: 59–132. ^ Lawrence, R. C., Helmick, C. G., Arnett, F. C., Deyo, R. A., Felson, D. T., Giannini, E. H., ... Wolfe, F. (1998). Estimates of the prevalence of arthritis and selected musculoskeletal disorders in the United States. Arthritis & Rheumatism, 41(5), 778-799. ^ Gates, G. A., & Mills, J. H. (2005). Presbycusis. The Lancet, 366(9491), 1111-1120. ^ Glasser, A., & Campbell, M. C. (1998). Presbyopia and the optical changes in the human crystalline lens with age. Vision Research, 38(2), 209-229. ^ Nusbaum, N. J. (1999). Aging and Sensory Senescence. Southern Medical Journal, 92(3), 267-275. ^ Strawbridge, W. J., Wallhagen, M. I., Shema, S. J., & Kaplan, G. A. (2000). Negative Consequences of Hearing Impairment in Old Age: A Longitudinal Analysis. The Gerontologist, 40(3), 320-326. ^ Leeuwenburgh, C. & Marzetti, E. (2006). Skeletal Muscle Apoptosis, Sarcopenia and Frailty at Old Age. Experimental Gerontology, 41(12), 1234-1238. ^ Roubenoff, R. (2000). Sarcopenia and its implications for the elderly. European Journal of Clinical Nutrition, 54(6). S40-S47. ^ Baumgartner et al. (1997). Epidemiology of sarcopenia among the elderly in new mexico. American Journal of Epidemiology, 147 (8), 755-763. ^ Evers, B. C., and Thompson, J. (1994). Organ physiology of aging. The Surgical Clinics of North America, 74(1), 23-39. ^ Hermann, M., Untergasser, G., Rumpold, H., and Berger, P. (2000). Aging of the male reproductive system. "Experimental Gerontology 35(9-10), 1267-1279. ^ Bjorklund, B.R. The Journey of Adulthood. Prentice Hall. ^ Schaie, K.W. (2001). Adult Development and Aging. Pearson. ^ Lledo, P.-M., Alonso, M. and Grubb, M. S. (2006). Adult neurogenesis and functional plasticity in neuronal circuits. Nature Reviews. Neuroscience 7, 179–93. ^ Gottlieb, G. (1998). Normally occurring environmental and behavioral influences on gene activity: From central dogma to probabilistic epigenesis. Psychological Review, 105, 792–802. ^ Kempler, D. Neurocognitive Disorders in Aging. Thousand Oaks: Sage, 2005. ^ Bayles, Kathryn, and Cheryl Tomoeda. The ABC’s of Dementia. 2nd ed. Phoenix: Canyonlands, 1995. ^ Borda, C. Alzheimer’s Disease and Memory Drugs. Ed. David J. Triggle. New York: Chelsea, 2006. ^ Zanetti, O., Solerte, S.B., & Cantoni F. (2009). Life expectancy in Alzheimer’s disease (AD). Archives of Gerontology and Geriatrics, 49, 237-243. ^ Alzheimer’s Association. (2013). 2013 Alzheimer’s disease facts and figures. Alzheimer’s and Dementia. 9(2), 1-68. ^ Kelly, Evelyn B. Alzheimer’s Disease. New York: Chelsea, 2008. Print. ^ de Lau, L., & Breteler, M. (2006). Epidemiology of parkinson's disease. The Lancet Neurology, 5(6), 525-535. ^ Chou, K. L., Taylor, J. L., & Patil, P. G. (2013). The mds−updrs tracks motor and non-motor improvement due to subthalamic nucleus deep brain stimulation in parkinson disease. Parkinsonism & Related Disorders, 19(11), 966-969. ^ Hauser, R. A., et al.. (2013). Extended-release carbidopa-levodopa (ipx066) compared with immediate-release carbidopa-levodopa in patients with parkinson's disease and motor fluctuations: a phase 3 randomised, double-blind trial. The Lancet Neurology, 12(4), 346-356. ^ Lang, P. E., & Obeso, J. A. (2004). Challenges in parkinson's disease: restoration of the nigrostriatal dopamine system is not enough. The Lancet Neurology, 3(5), 309-316. ^ Zarit, S. H., & Zarit, J. M. (1998). Mental disorders in older adults: Fundamentals of assessment and treatment. New York: Guilford Press. ^ Alexopoulos, G. S. (2005). Depression in the Elderly. The Lancet, 365(9475), 1961-1970. ^ Daffner, K. R., Ryan, K. K., Williams, D. M., Budson, A. E., Rentz, D. M., Wolk, D. A., & Holcomb, P. J. (2006). Increased responsiveness to novelty is associated with successful cognitive aging. Journal of cognitive neuroscience, 18(10), 1759-1773. ^ Cavanaugh, J., & Blanchard-Fields, F. (2015). Chapter 6 - attention and memory. In Adult development and aging, 7th edition (pp. 216-244). Stamford, CT: Cengage Learning. ^ Dainese, S. M., Allemand, M., Ribeiro, N., Bayram, S., Martin, M., & Ehlert, U. (2011). Protective factors in midlife: How do people stay healthy?. GeroPsych: The Journal of Gerontopsychology and Geriatric Psychiatry, 24(1), 19. ^ Urry, H. L., & Gross, J. J. (2010). Emotion regulation in older age. Current Directions in Psychological Science, 19(6), 352-357. ^ Hansson, R. O., & Stroebe, M. S. (2007). Bereavement in late life: Coping, adaptation, and developmental influences. American Psychological Association. ^ Kahana, E., Kelley-Moore, J., & Kahana, B. (2012). Proactive aging: A longitudinal study of stress, resources, agency, and well-being in late life. Aging & mental health, 16(4), 438-451. ^ Costa Jr, P. T., & McCrae, R. R. (1994). Set like plaster? Evidence for the stability of adult personality. ^ Mõttus, R., Johnson, W., & Deary, I. J. (2012). Personality traits in old age: Measurement and rank-order stability and some mean-level change.Psychology and aging, 27(1), 243. ^ Donnellan, M. B., & Lucas, R. E. (2008). Age differences in the Big Five across the life span: evidence from two national samples. Psychology and aging, 23(3), 558. ^ Mühlig-Versen, A., Bowen, C. E., & Staudinger, U. M. (2012). Personality plasticity in later adulthood: Contextual and personal resources are needed to increase openness to new experiences. Psychology and aging, 27(4), 855. ^ Baltes, P. B. (1987). Theoretical propositions of life-span developmental psychology: On the dynamics between growth and decline. Developmental Psychology,23(5), 611-626. ^ Neisser, U., Boodoo, G., Bouchard, T., Jr., Boykin, A., Brody, N., Ceci, S. J., ... Urbina, S. (1996). Intelligence: Knowns and Unknowns. American Psychologist, 51(2), 77-101. ^ Thurstone, L. L. (1938). Primary Mental Abilities. Psychometric Monographs, 1, Xi-121. ^ Hertzog, C., & Schaie, K. W. (1988). Stability and change in adult intelligence: II. Simultaneous analysis of longitudinal means and covariance structures.Psychology and Aging, 3(2), 122-130. ^ Horn, J. L., & Cattell, R. B. (1967). Age differences in fluid and crystallized intelligence. Acta Psychologica, 26, 107-129. ^ Cavanaugh, J. C., & Blanchard-Fields, F. (2015). Chapter 5- where people live: Person-environment interactions. In Adult development and aging (7th ed., pp. 127-156). Stamford, CT: Cengage Learning. ^ Shulman, N. (1975). Life-cycle variations in patterns of close relationships. Journal of Marriage and Family, 37(4, Special Section: Macrosociology of the Family), 813-821.